eSpecially Ben: Mickey...Here We Come! 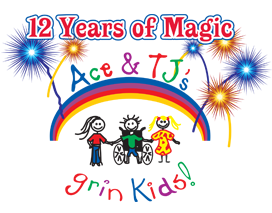 Ben was accepted by the Ace & TJ's Grin Kids program this year to visit Disney World. Ben has graciously asked the rest of his family to chaperon him. Woohoo! We are going to see Mickey! If you just started reading eSpecially Ben, please go back and read about our history with Ace & TJ. We will keep you updated on our Disney plans. So far the kids have watched the Disney Vacation DVD no less that 15 times. To say they are excited would be an understatement. Ryan has plans to have us at the gates at 7am each morning with itinerary ready (I am not making this up). For Ben, he is not going to know what hit him! Check out the Grin Kids Website - your family may qualify to participate in the program. And if you just want to support the organization, Grin Kids fund raises throughout the year for this program. If you are interested in seeing how you can donate or volunteer, there are resources here. Oh my goodness!! Congratulations!! What a great opportunity for Ben & your family.